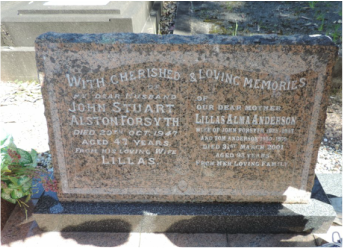 John Stuart Alston FORSYTH was born in Goulburn in 1900, son of James Imlay FORSYTH and Ann Jane (STEEL). He attended primary school at Beecroft where his father was principal from 1902 to 1924. John was awarded a bursary to Hurlstone Agricultural High School and then Hawkesbury Agricultural Collage 1915 – 1916 where he obtained the Hawkesbury Diploma in Agriculture. He enlisted as a private in the AIF during the Great War and after basic training was actually boarding a ship in Sydney when peace was declared in 1918. ​In September 1928 John FORSYTH married Lillis Alma SMITH who was the daughter of Richmond and Florence Smith. They had three children. His carrying/transport business continued to grow, and soon extended to The Entrance, Sydney and Newcastle. 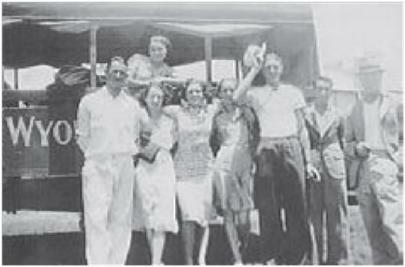 John and Lillis continued to run the transport business from a depot on the corner of Warner Avenue and Levitt Street until ill health forced its sale shortly before his death in 1947. John Stuart Alston FORSYTH is buried at Jilliby Cemetery. Lillis/Lillas Alma FORSYTH married again in 1950, to Arthur Charles (Tom) ANDERSON. Lillis died in 2001, and is buried as ANDERSON in John FORSYTH’s grave.